Thistle Bees by Lanarte. PN-0021870 | Cross Stitching Heaven. 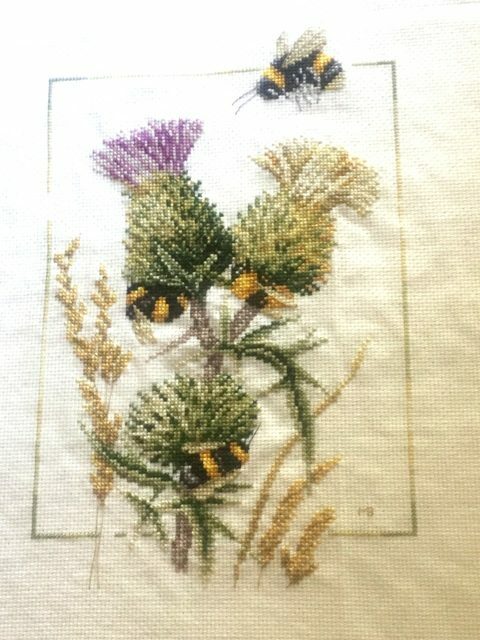 Thistle bees by Marjolein Bastin. Lanarte is the latest commission I have received. Lanarte produces beautiful Cross stitch kits, which you can see or purchase by clicking on the link in this paragraph. This was my latest commissions using my favourite DMC threads. It’s from the animal’s collection on 14ct white Aida fabric with dimensions 23 cm x 32 cm. You can purchase this kit by clicking on the image below. The kit is also available to purchase as an Evenweave kit below. This kit came with the largest stitch pattern I have ever seen – almost double the size of the actual project! The pattern was, therefore, easy to read but was tricky to physically handle due to its size. In addition to this, there are no half stitches or French knots needed in this picture. The back stitch is minimal, thankfully, and worked in long stitch which seems to be how all the modern patterns create their finishing touches. In light of this, it was quick and easy to finish off – normally a task I dread! BEWARE of the border. The threads come on a numbered card which corresponds to a given symbol on the stitching chart, as usual. However, when it comes to the border the symbols are numbers which I assumed was the given colour number, but I was WRONG! It was only when I finished and looked at the completed project I thought “something doesn’t look right!” So, I checked the picture that came with the kit and to my horror found I’d used the wrong colours. The numbers around the border represented completely different colours to those on the thread card and should have been a single thread not a double. It did clearly state this on the pattern but I had just assumed and not checked. Oops! Time to unpick and restitch.